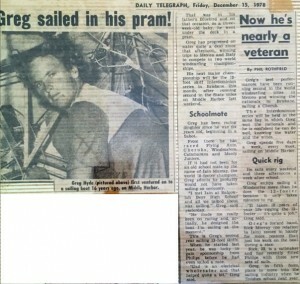 Major Accomplishments include (sure Greg has more)"
Greg sailed in his pram! That was in his father's Bluebird and on that occasion, as a three-week old baby he went under the deck in a pram. Now he's nearly a veteran. 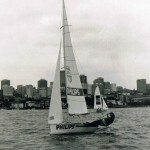 Greg Hyde sailing in Sydney Harbour. 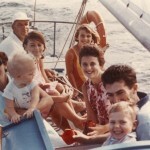 Greg is 5 from the left/4 from the right in a life jacket. 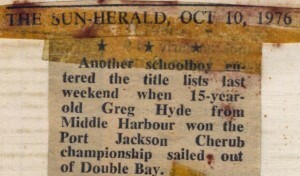 Another schoolboy entered the title list last weekend when 15-year-old Greg Hyde from Middle Harbour won the Port Jackson Cherub championship sailed out of Double Bay. 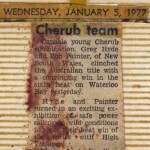 Middle Harbour boats scooped the pool in the recent Cherub National Titles held in Brisbane. Winner was HIGH VOLTAGE sailed by Greg Hyde and crew Bruce Painter, followed by Stardust, Andy Pearson second, and Farr Faster, Tony Hannan third. Greg's win was an outstanding performance considering chat he has had less than a full season sailing in this highly competitive class. His placings over the series were 2.2.3.1.1.1.1. Proud father of the winner, Ron Hyde, skipper of No. 1 Division boat Aurora, has not stopped smiling since the titles finished. Highly creditable also was the performance or Andy Pearson who won two heats and also the Invitation Race. 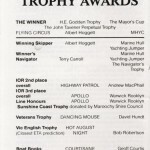 Tony Hannan was always in contention as also were other Middle Harbour boats Speed of Sound (Robert Wilmot) and Spitfire (Graham Ferguson) who filled places in individual heats. 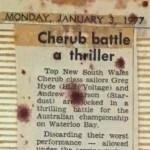 There can be no disputing the fact that the Club now races the hottest Cherub fleet in Australia. 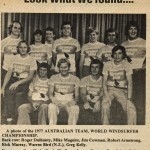 Back Row: Roger Dulhunty, Mike Maguire, Him Cowman, Robert Armstrong, Rick Murray, Warren Bird (NZ), Greg Kelly. 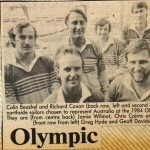 Front Row: Greg Hyde, Kevin Wadham, Jurgen Castens, Greg Johns, Robert Wilmot. That was in his father's Bluebird and on that occasion, as a three-week old baby he went under the deck in a pram. 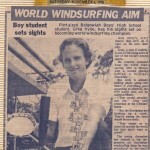 Greg has progressed on water quite a deal ring that afternoon, winning trips to Mexico and Italy to compete in two world windsurfing championships. His nest major championship will be the 12-foot skiff Interdominion series in Brisbane this month, after running second In the State titles on Middle Harbor last weekend. 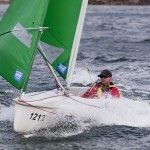 Greg has been racing dinghies since he was six years old, beginning in a Sabot. 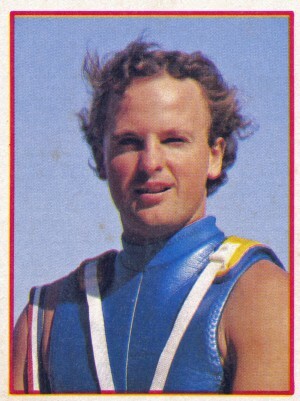 From there he has raced Flying Ants, Cherubs, Windsurfers, Catamarans and Manly Juniors. If it had not been for an old-school mate by the name of lain Murray, the world 18-footer champion, Greg admits he probably would not have taken sailing so seriously. 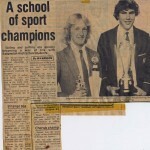 "I met Iain at Balgowlah Boys High School and all we talked about was sailing" Greg said yesterday. 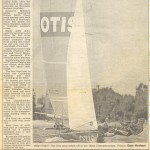 "he made me really keen on racing and, actually he designed the boat I'm sailing at the moment". This is Greg's second year sailing in 12-foot skiffs. 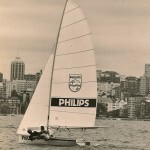 When he started last year, he was lucky to gain sponsorship from Phillips before he even sailed a race. "Dad is an electrical wholesaler and that helped quite a bit", Greg said. 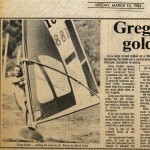 Greg's best performances have been sailing in the world Windsurfing titles in Mexico and winning the nationals in Brisbane, sailing a Cherub. 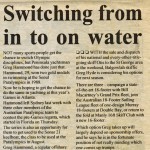 The Interdominion series will be held in the same bay in which Greg won the nationals and he is confident he can do well, knowing the water and the winds. Greg spends five days a week, every week sailing on Middle Harbour. He sails every weekend and three afternoon a week after school. Greg enjoys sailing a Windsurfer more than he does the 12-footer because it only takes a minute to rig. "It takes 10 years of your life rigging the 12-footer - it's quite a job", Greg said. Greg's for'ard hand Rick Murray (no relation to Iain) comes in handy for more reasons than just his work on the boat during a race. 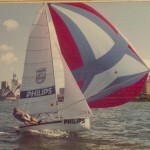 Rick 22, is a sailmaker and has recently fitted Phillips with three new sets of sails. Greg in his fifth form. 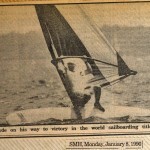 Plans to move into the sailing industry when he finishes school next year. Greg is now studying Business Administration at Curing-gai College of Advance Education. 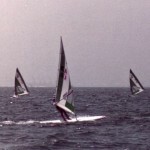 * 1981 - 6th WSC World Championship held Okinowa Japan. 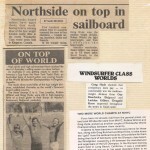 Also Won the the tough 14km Daily Mirror sailboard marothon. 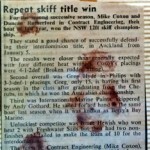 * 1982 - Dufour Australian National Champion WSC - lightweight division. 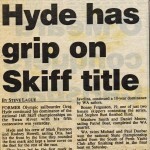 "Hyde" is 22, and weighs 64 kg (he put on another 2 kg before the Worlds to put himself right in the middle of his weight bracket). 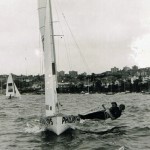 He grew up sailing off-the-beach boats like Manly Juniors, Flying Ants, 4205 and Cherubs, in which he won the Nationals, then moved into 12-Foot Skiffs where he finished "second in everything". 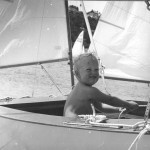 Now he sails his father's J24, puts in an occasional appearance as 16-Ft Skiff skipper and likes getting on offshore yachts. He's been boardsailing for seven years, winning his weight division at the Windsurfer Nationals three times and winning the slalom and freestyle at the last series. 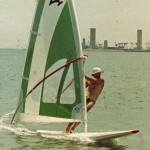 Of the three Windsurfer Worlds he attended before this year's, his best performance was a second in the lightweights at Cancun, Mexico, in 1978. As training this year, Greg tried to average 20 hours a week on the water. He just sailed around the harbour, racing against anyone else he found: "There's always someone out there." The monotony of it became a bit of a problem: "By the time I got overseas it bored me to tears, and I didn't spend a minute more on the board than I had to. 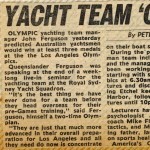 But that seemed to work in my favour in the series -- the guys who'd been out sailing for fun between races started to get tired while I didn't." Looking at the opposition, he says: "The 'Euros' just pinch, pinch, pinch - they 'chew the booms' better (a light air stance with the face close to hands on the wishbone) and they're very fast in light airs, but slow in a breeze. The Americans reach everywhere so they're fast in a breeze but they don't point." 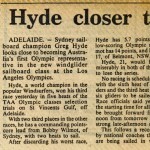 With no idea of how he'd go, and with a sailing style between those two extremes, Hyde went out and won the first race. He wasn't happy in light airs and finished 10th and 14th in the next two heats, but followed up with a fourth, second and first. A second in the final heat sealed his victory. Now he's wondering about the Olympics. He was selected as an Aussie Windglider rep for the pre-Olympics this year, but didn't go, believing it wasn't worth the expense. He argues: "It would be fairer not to hold the Windglider Olympic series next year. 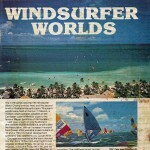 There are criteria for Olympic sailing classes and the Windglider doesn't meet them. It's supposed to be one design. At the moment you can have two different rigs and about three different centreboards. It's supposed to be available worldwide. It's not in this part of the world; you have to bring them in yourself. It's supposed to be economically within reach. But it's a very expensive board. I think the Mistral Superlight would be a much better choice." So he's undecided, and looking at 470s. A family conversation ensues. Greg thinks it could be worth setting aside his business administration study for a while to go for the sporting ideal; his father thinks after all the excitement, even gold medals are tucked away in a drawer, but education and qualifications are needed to get through life. So far, Greg's been combining the two. ABS: Tell us about your sailing career. 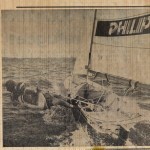 GH: I started sailing with my father, when I was very young. 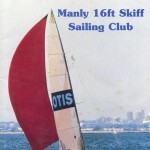 I had my first skiff, a Manly Junior, when I was eight. I then went on to sail Flying Ants and Cherubs. 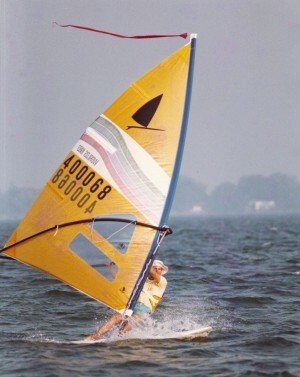 I started boardsailing when I was 14 years old, as well as 12ft skiffs. 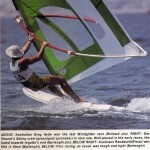 For the last few years I have been racing a J-24 and boardsailing. ABS: What was your first introduction to boardsailing? 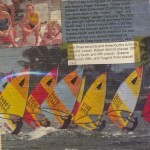 GH: I was at the Combined High School Sailing Regatta, held at Belmont and a couple of friends had Windsurfers. 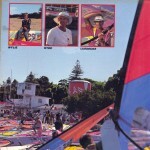 I found starting no problem and the day I got back to Sydney I bought a Windsurfer. 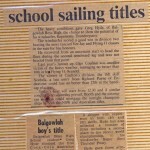 ABS: Could you run down your titles in boardsailing past and present. 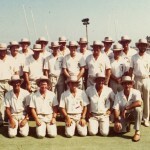 * 1979 - 2nd National WSC held Port Stephens. 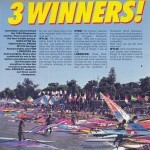 * 1981 - 6th WSC World Championship held Okinowa Japan. 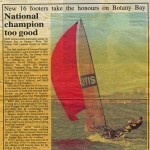 * 1982 - National WSC 1st Light medium held Port Stephens. 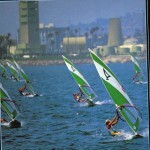 ABS: The pre-Olympic regatta is being held in Los Angeles at the present. You were selected, what made you decide not to go? GH: Mainly due to funding (airfares, buying a Windglider board over there), I can easily train here, maybe I won't get the racing experience but I feel I have enough big racing experience. Also, it conflicts with college. However, I would have gone if I had had funding. ABS: Who went in your place? GH: Bruce Willie, in the end. 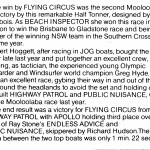 ABS: Due to the stringent patent laws in Australia, Windglider is not a racing class. How do you feel this will affect the performance of our team? GH: Not much really. They will be a racing class by the time the selections are held in Adelaide. We will have six months on Windglider and that's plenty. You don 't get that much better after six months on a new board. Windsurfer boards are only slightly different. The only thing that will make it different and more difficult, will be not being allowed to use a harness. It's going to hurt a lot more and I don't agree with this. ABS: Originally in WSC racing, you were not allowed to use a harness. How did you cope then? GH: In Cancum - Mexico and Sardinia, I did alright. I think it was easier then using Windsurfer boards but Windglider equipment such as Mylar sails and aluminium masts, will make it harder. 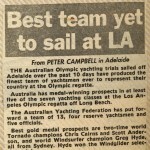 Due to the light to medium winds in LA, it will be hard," however the selection regatta to be held in Adelaide will be hard too, due to the prevailing strong wind conditions. ABS: Why have they chosen not to use a harness? GH: Just the class rules. I don't know why. They have made it into a weight lifting contest rather than a sailboard contest. ABS: So you feel it will be strength over skill. GH: No, it's still skill! It just means that the people who have the skill, will also have to be strong. 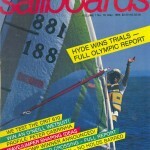 ABS: Now boardsailing is an Olympic class, there is contention regarding amateur and professional status. How and why do you keep your amateur status? GH: Keeping amateur status, you don't go into any ads, or take any money for regattas (you are allowed to get expenses) that sort of thing. You are allowed to be sponsored for equipment, as long as you don't violate Rule 26. ABS: You mean advertisements on sails? 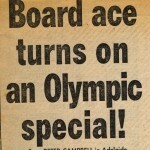 GH: Well, just to get a crack at the Olympics. I only want one go at it. After that, the challenge will have worn off. It's like winning the America's Cup. The first team to take it off the Americans will be really good and the first person to win a Gold Medal also but after that -_ well it's been done, hasn't it? The Olympics will be good because it cuts out the professionals. 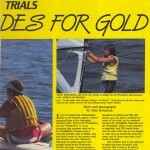 I think it will be easier to win the Gold Medal than the WSC Worlds this year. ABS: The Olympic boardsailing class will have only one weight division; you're in the light medium weight division - do you think this will be to your advantage? GH: The Olympic champion will come out of either the light medium or heavy medium division . . . Stephen Vandenberg is getting too big - he is growing, Bobby Wilmot is getting too big also. 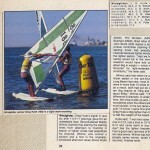 I think about 65 kilos will be the maximum and maybe the minimum, because Windgliders are hard boards to sail. If it's windy, I suppose Bobby will be fast but in LA it's light. I think the heavies will have a bit of a problem racing guys who are lightweight, as long as they are strong too. That's why people who are big are winning at the moment, because of their sheer strength. ABS: So what you are saying is that someone lightweight and strong will win. GH: You will also need stamina and a will to win. That will be the big thing; how much adrenalin you can put in your veins to try to keep you standing upright, strong and thinking straight. ABS: You don't think that the Olympics will be tactical, that it will depend more on strength. GH: There will be more strength involved than say Windsurfer class racing but it's still going to be tactical. LA lends itself to the people who are very, very fast and strong, because it's a one-way course. You have to go right (the wind goes from west to north all afternoon) and you will have to get on the right-hand side, near the lay line, so you can take advantage of any lifts which will occur. ABS: So it's the same as I every regatta - success needs a start . . .
GH: Oh yeah! Every regatta but this regatta will depend more on a good start. ABS: You have boardsailed on the international circuit - did you notice any differences between nationalities? GH: The French are very good - the Italians are not so good but they make up for it in some other antics. GH: Pumping. They exploit the rules to the maximum. So does everyone to an extent but the Italians seem to be doing it all the time, whereas other nationalities just dabble in it now and then. The Italians and the Germans are pretty aloof, everyone who speaks English congregate together. The French and Swiss mix and mingle a lot. For example, Karl Messmer, he's always with the English speaking; he speaks English and spends a lot of his time in Hawaii. It's broken up not so much by country but language. GH: Not so much the English, as I have only seen one English team at a Windsurfer regatta. But the Americans, the Aussies and the South Africans all seem to congregate together, because of language and, I guess, similar lifestyles. ABS: How do you feel about the Japanese? GH: They are really good people, they try to help you. A good example of this came up at the J-24 Worlds. After the last race a Japanese guy came up to me and said, "We are friends" and gave me and each member of the crew a really nice T-shirt, which he had brought over especially to give, not to swap, just to give! 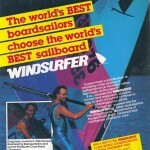 ABS: Will you be boardsailing at the WSC Worlds and Dufour world titles this year? 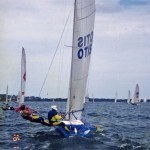 GH: Not the Dufour Class but at the WSC Worlds - yes! They are being held in Kingston, Canada. ABS: Are you being sponsored? 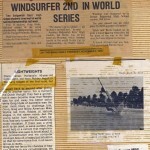 Winters I won the airfare (from Sailboards Australia). ABS: Who are the major sponsers of WSC? GH: Coke is the only sponser really. 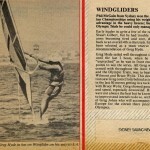 Sailboards Australia help the Windsurfer team but in boardsailing in general it's Coca Cola. 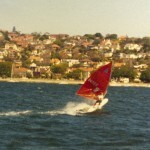 ABS: The Australian WSC Mid-Winter championships were held recently at Rose Bay; how did you go? GH: 1st in lightweights division. ABS: Was it a difficult regatta. 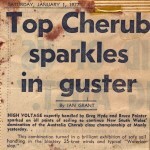 GH: It was for lightweights. We had a strong division. 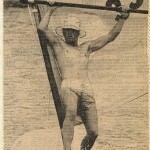 Stuart Gilbert got 4th in the WSC Worlds and Bruce Willie, 2nd. Tim Clarke was right up there in lightweights at the last Worlds. We have maybe, not the hardest division in Australia but certainly the most competitive for a World WSC chance (at least I'm hoping that way). I want to go away psyched up thinking that if I can beat these guys who are the top in the WSC Worlds, I will be top in the world, when I come home. ABS: Are the lightweight medium and the heavies traditionally the strongest fleets? GH: For Australia yes! Good people seem to congregate in the light medium and heavies; a lot of people seem to put on a lot of weight very quickly and take it off very quickly before regattas. 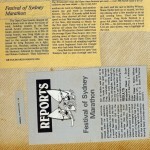 ABS: How do you psyche yourself up for a major regatta? GH: For really big regattas, I make sure none of my equipment is going to break. If I don't get a new board, I will wash my board with detergent to get rid of the oil accumulated sailing in the harbour. ABS: ls that to reduce skin friction? GH: No, it doesn't do that but you tell your competitors it does! I remember at the Dufour Nationals last year, we had one guy believing that MPF in toothpaste stood for Multi Functional Polymere (is there such a word?) and because polymere did something to the skin friction on the boundary layer, it made him go faster. He actually believed it! It was the funniest regatta and then a friend (Mich Miller) got Preen to spray on his sail and had one unnamed sailor doing it! It was a big stir. . .
ABS: Do you do any special training, before a regatta? GH: Yes. Oh, really nothing special, I just go sailing as I usually do but a lot more often. For the mid-winters, I practised only racing - not freestyle or anything else. I do a lot of slalom. I just play doing slash gybes, which helps my racing. Before the Worlds, I will get a Mylar sail and a new mast, as they will be the equipment used during the WSC Worlds this year and practise solely with these, even though I will still sail regattas in Australia with Dacron sails, as that's the only sails class legal in Australia. 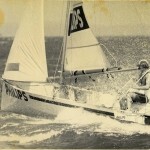 ABS: Will Mylar sails become class legal soon? GH: Yes, in about one year. I think they will be slower though. 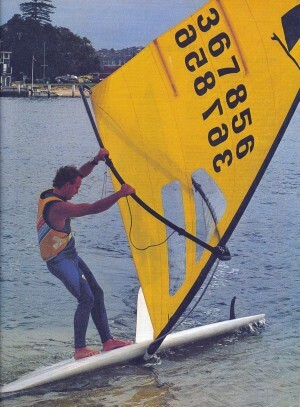 The Neil Pryde Mylar sails I've seen aren't as good as the Dacron WSC sails. ABS: How does it feel when you know you will win a regatta? 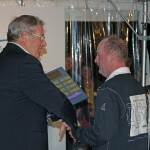 GH: I never know that I will win a regatta until I have got the points on the board, won that race. I'm one of those people who will go through the whole thing. I won't get happy until I know that thereare no protests against me. I'm really cautious about getting happy, because until you have the points on the board it can be taken away from you. Until you have won the race, even if you are only 10 yards from the finishing line, you can still lose a race, so you have to just 'go for it'. ABS: With so many facets of boardsailing, why have you stayed with regatta sailing? 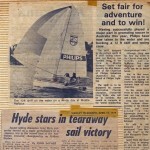 GH: Regatta sailing is the foundation of boardsailing. I think that wave performance contests will become a bigger part of boardsailing and it will probably overtake it in the media sense - however they will be so hard to co-ordinate. Look at the trouble they have with Windsurfing regattas; needing correct wind and then add to that the fact that wave performance regattas need at least 15 knots of wind with surf as well! For example, Surf-about. They have to trek everywhere to get decent surf -- and now there is two contingencies: wind and surf. Which is going to make it very hard to schedule contests. I love sailing in the surf (it's top fun) but that's where I think it ends. If you want to aspire to be really good at it, sure, go in all the contests, go to Hawaii. If you had the good surf conditions, like people in Tourquay and Hawaii. Australia has excellent surf conditions compared to anywhere else but you need theconditions all year around to get really good at wave performance. ABS: In my experience, I have found that people who stay with regatta boards are sailors and the ones who go to the surf are predominantly surfers. Do you agree? 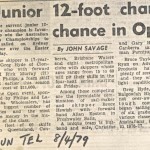 GH: Predominantly yes but look at Scotty O'Conner, he was a national Manly Junior champion and seemed pretty bored with Windsurfer, so he went wave jumping. He has had the opportunity to go overseas to do it, to go to Hawaii with Crit, instead of staying in Australia. I enjoy racing a lot. It's easier, it's less hassle for the fun I get out of it. it's easier than going into the surf, although I do have a lot of fun on days that are right (good conditions) I only go out into the surf, when it's good conditions - however if I was aspiring to be a champion in the surf I would have to go out in all conditions, in case they hold a contest in conditions like that. They are not going to be able to hold contests in perfect conditions all the time. ABS: Will you be competing in the Gold Cup on the Gold Coast? GH: No, I would love to and I really think that I should. A lot of people who have donated equipment say that I should. They put these regattas on and have no understanding of what people who go to uni. do - it overlaps with exams. I can't get away for it, I want a degree as well as to go sailing. ABS: It seems notable that the top wave contestants have been top for the last few years. |t's obvious they have the sponsorships to stay in Hawaii . . .
GH: No one will ever catch Robbie (Naish). He just got into it too early and he now has the feel for it. He is not too good on short boards; you can see that Peter Cabrina is much better on short boards than Robbie. Robbie is a sailor before he is a surfer. 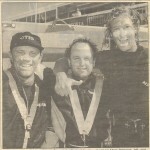 They have the money and conditions and they will be at the forefront in surf sailing for a long time. Outside of Hawaii, I don 't feel it is that important. Hawaii is where everyone wants to go 'the Mecca of boardsailing'. ABS: What type of boards do you own? 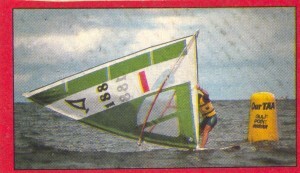 GH: At the moment, a Windsurfer Regatta board - that's obvious - a New Toy by Mark Paul. I was going to get a Bombora Proto but the New Toy is identical, costs half as much and is more durable. 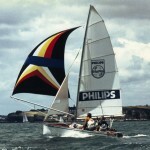 I would suggest a Tri-Fin by Mark Paul to anyone who is not that good - that is for intermediate sailors. If you can handle 20-25 knots without falling in on a Windsurfer, go straight to a New Toy; you can't sail a New Toy in 15 knots, it sinks! 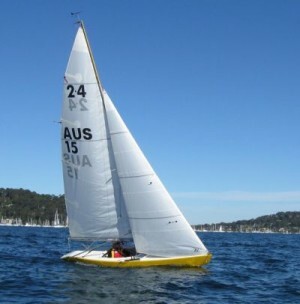 I get the use of a M1 (Mistral) from Mistral and Sailboards Australia to sail open class regattas. I'm one of the Mistral Open Class team. ABS: What type of sail do you prefer? 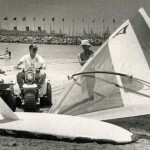 GH: On my short board I use Gaastra and Mylar sails - 5.5, 5.0,4.5 and 3.8 square metres. The most important and the main ones I use are 5.0 and 3.8 square metres. On the M1 I use Gaastra racing sails (made in Hong Kong). They're really good. ABS: What about the harness? GH: I use a Gaastra spreader harness without the spreader, because of the weight of the spreader. I have my hook down, because I carry my harness hook low, as I have my booms as high as possible (i.e., on Windsurfer) so I get more leach tension. This seems to make me point higher and give me more power. I also have my out-haul really loose to compensate for my leach tension. When it gets windy and you want to use your harness, you want it to pull down, naturally. Top overseas competitors use a hip harness to pull down on the rig. I use a low hook with booms as high as possible and the harness straps not much longer than normal. You have to get right on your toes and jump to hook in and then you just sit in your harness, it gives you more power. 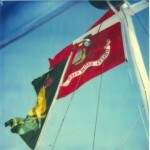 lt's a lot harder to learn and sail as it's easier to be lifted and catapulted. You can't use your harness in really gusty conditions, so you use your arms more. You have your feet further aft on the board so that you lean forward. To stop yourself leaning too far forward, you pull down on your back arm; when you are hooked in your harness, this pulls down on the back of the booms - which gives you a tight leach. ABS: What are your strongest abilities in regatta racing? GH: Attitude is really important. I love to win - and that's where it starts. Experience with the wind is the most important factor. I have never been the best board-handler in the world, or been really fast. Being able to read wind shifts gets me to the front. As I have never been really fast, I concentrate on the wind rather than my board speed. My favourite wind strength is 15- 18 knots, as I don't have to worry about my board speed. I know that everyone goes the same speed in that wind, the board will naturally go high and fast, so I can then concentrate on the wind. 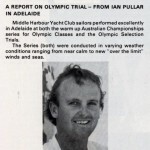 Middle Harbour Yacht Club sailors performed excellently in Adelaide at both the warm up Australian Championship series for Olympic Classes and the Olympic Selection Trials. The Series (both) were conducted in varying weather conditions ranging from near calm to new "over the limit" winds and seas. The Clubs congratulations for selection must go to Greg Hyde (Windglider) and to Jamie Wilmot (Flying Dutchman) for their well-earned selection in the team and the right to wear the Green and Gold blazer, and especially to Jamie for this National Title victory in the class. We wish them every success in their striving for medals in Los Angeles. Middle Harbour was well represented at the series conducted at the North Haven Marina complex of the CYCSA on behalf of the SAYRA for the AYF. 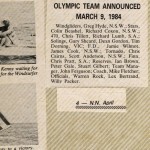 Bobby Wilmot (Windglider) who narrowly missed an Olympic guernsey made selection for the Windsurfer Demonstration event, also to be held in Los Angeles coincident with the Games. Youngsters from the Club. Anthony Puller and Keill Price. them for the experience, gave notice for the future with high placings (3rds and 4ths) in some heats of the Windglider Selections to finish 9th and 10th respectively with Greg Butchart finishing 9th. Keill Price romped in the marathon for the Windsurfer Demonstration selections to finish 4th overall and narrowly miss out on selection. 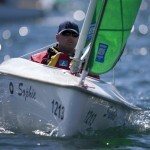 Ben Lehmann (FD) also gave notice for the future for some very consistent sailing to finish 6th overall in the trials. 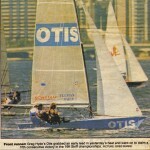 Gary Geitz and Greg Johns were always in the top third of the 470 fleet but finished 6th overall in very hot company. 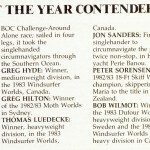 Northsider board-sailors have again shown their world-beating form by winning three of the four weight division world titles at the recent Windsurfer Class world series held in Kingston, Canada. Five hundred 'competitors from 25 countries contested the event in four disciplines - triangle racing, marathon, slalom and freestyle. 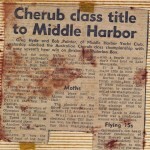 In the triangle racing, Greg Hyde won the medium weight division, Robert Wilmot the light heavyweight, and Tom Luedecke the heavyweight. 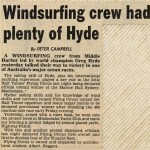 If you have not already red from the general press, our two local Windsurfer stars from MHYC, Robbie Wilmot and Greg Hyde, picked up another couple of Windsurfer World Championships between them recently. 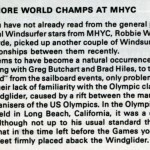 It seems to have become a natural occurrence for these two, along with Greg Butchart and Brad Hiles, to take home the "gold" from the sailboard events, only problem for them being their lack of familiarity with the Olympic class board, the Windglider, caused by a rift between the manufacturer and organisers of the US Olympics. 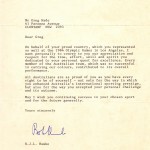 In the Olympic training event held in Long Beach, California, it was a creditable 17th. Although not up to his usual standard there is no doubt that in the time left before the Games you will see Greg's feet firmly placed aback the the Windglider. 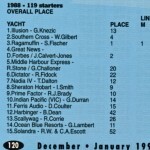 The 1983 Windsurfer Class nationals were held over Christmas/New Year at Mooloolaba in Queensland. Each year they are the biggest yachting event in the country, and l 983 set a new record with 272 competitors. 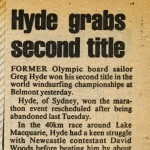 Our Olympic representative Greg Hyde won the lightweight division, Lachlan Gilbert the mediumweights, while Bobby Wilmot, the runner up at the Olympic trials and Olympic Boardsailing Exhibition (O.B.E.) event team member, won the light heavyweights. Phil McGain won the heavyweights. Melanie Braund won the ladies division and, with her runners-up Sarah Kenny and Bruce Wylie, they make up the Australian team for the O.B.E. event at the Olympics. 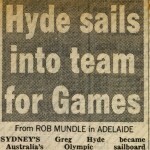 Since being selected in Adelaide for the Olympics Greg Hyde has been competing in Europe. He has won every major event that he has entered and defeated the top seed Stephan Van Den Berg. 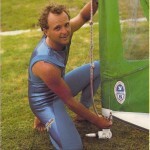 Greg was one of the first sailors to buy a sailboard when the sport was introduced to Australia in 1977. 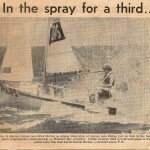 He has always been one of the top if not the top flat-water racer in the country. Right through that time he has continued his full-time study and even made some more time for a few skiff and yacht titles. Even with the ever-expanding meaning that seems to be given to "amateur" Greg still fits into the real meaning. 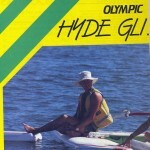 Greg Hyde: Winner, medium weight division, in 1983 Windsurfer Worlds, Canada. 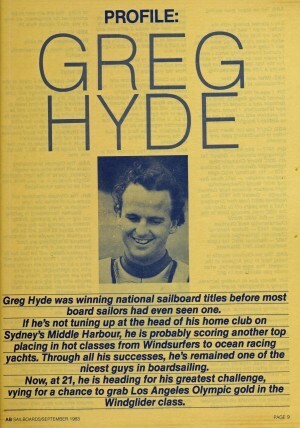 Sailing was a big year for Greg Hyde in 1984. 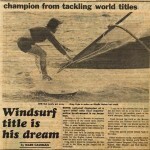 He achieved 6th place in the Windgliders at the Los Angeles Olympic Games, was the World Champion of the light medium weight Division of Windsurfers in Australia, came in the British Open Windgliders and won the Australian Windsurfer Nationals in Lightweights triangles, freestyle, slalom and Pentathlon divisions. 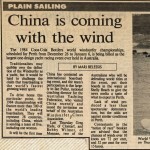 AS THE 290 competitors arrived at Mooloolaba for the 1984 Windsurfer nationals, weather conditions were everything the travel brochures promised. 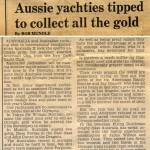 The event was run by Mooloolaba Yacht Club in conjunction with the Windsurfer Class Association of Queensland, and was the first national series held in open waters. 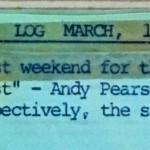 This was to become significant later. 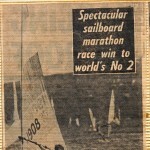 The marathon was the first event, starting in a perfect 10-12 knot sea breeze. 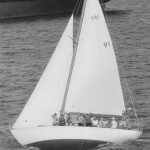 The course was fairly long at 11.5 nautical miles, from the start close to the shore near the Mooloolaba Harbour entrance, and took competitors around "Old Woman" Island after a long reach, then around a small triangle. The breeze died throughout the afternoon and was only 3-5 knots at the finish. 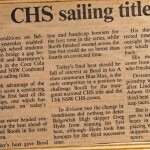 Up-and-coming young Sydney sailor Keill Price led the race from start to finish and won narrowly from Newcastle star Bruce Wylie. 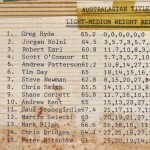 World mediumweight champion Greg Hyde was a comfortable third. 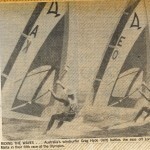 The following day heralded the start of the triangle racing, and right on cue the sun disappeared and the rain settled in, for the duration of the regatta. After an hour's postponement race one was away. Ten minutes after the start the wind came in at about 25 knots. And the rain poured down, so none of the competitors could find the marks. 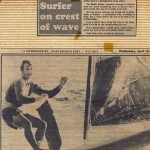 And the swell got bigger, so most of the competitors had trouble handling the conditions. The crunch came when some of the competitors began to get blown away, and two were injured. Racing was abandoned for the day and the race committee started the long job of accounting for all 290 competitors. Eventually, all but two were accounted for and a major search, which included all Mooloolaba Yacht Club's rescue boats, the Westpac Rescue helicopter, the local surf clubs and Police, was mounted. One competitor was later found in a fish and chip shop, and the other nonchalantly wandered in next morning. 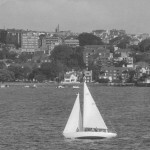 Both competitors were dismissed from the regatta. The incident underlined the importance of mandatory sign on/off procedures for events like this. Thursday featured the slalom preliminaries and despite the miserable weather many spectators turned out to watch some of the best slalom racing ever seen in this country. Because of the terrible weather the slaloms were held on the river. 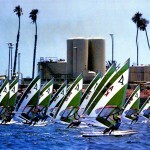 More than 100 unseeded sailors competed for the 16 places in the finals. Since slalom racing is one-on-one sudden-death elimination, the action was intense. Triangle racing was scheduled for Friday and again racing was postponed while anxious officials scanned the horizon. Eventually the "thumbs up" was given and three races were sailed. 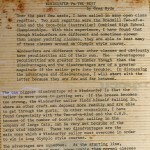 Most sailors had great trouble handling the large swell and the rain squalls made finding the marks interesting. Retirements were high but there were no lost sailors. Saturday was busy for most of the better sailors, with the freestyle preliminaries scheduled for the morning and the slalom finals in the afternoon. The area originally designated for the freestyle was just outside the breakwater but very close to shore for the large spectator audience. Officials took one look at the metre-high swell running through the area and moved the Freestyle preliminaries back into the harbour, conducted from the ends of the marina jetties. This proved to be quite suitable if you ignored the occasional yacht, trawler or pleasure boat motoring through the course. The competitors took it in good spirit and some quite professional performances were turned in, particularly by the girls. 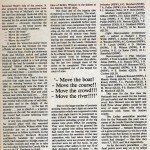 The slalom finals were postponed while race officials battled to set the course in the river, the marks having to be set across a 3-knot outgoing tide with anchors that would not hold on the muddy bottom. Eventually racing got under way and the 32 best slalom sailors in the country did battle. 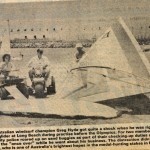 As Greg Hyde and Phil McGain started in the final to decide the Australian champion, a 30 degree wind shift swept across the course, making it necessary to abandon the race and reset the course. 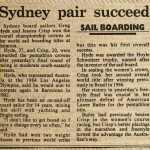 Hyde and McGain were called and Greg Hyde became Australian Slalom Champion. 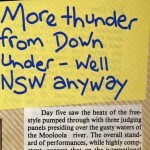 Next day gusty winds and the odd rain shower made good freestyle routines almost impossible, but Greg Hyde clinched the title from Bobby Wilmot with a well-executed rail pirouette. 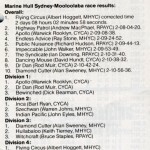 Bruce Wylie was third. 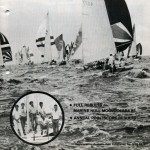 Triangle racing was held in the afternoon, with the ladies, lightweights and medium weights on course one getting in two good races, despite adverse conditions. The light heavyweights and heavyweights were not so lucky on course two when, after the end of the first race the leeward mark slipped its moorings and headed for shore. 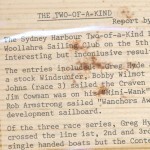 When the leaders in race two had to pick up their boards and carry them round the leeward mark, high and dry on Alexandra Headland, the committee decided enough was enough and abandoned the race. Monday, the last day, dawned bright and clear. The sun came out and the wind went home. Triangle races were again scheduled, but the first was abandoned due to lack of wind and all the competitors had to paddle back to shore. 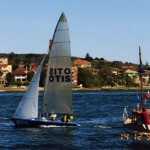 Two races were held later in the afternoon in a very light and shifty sea breeze. Later that evening everybody gathered for the presentation of the trophies and to discuss what a good series it had nearly been when the computer, forced to digest a meal of last-minute protests and incomplete lady's results (the ladies slalom finals were not completed due to the loss of time earlier in the series) regurgitated the lot and blew a fuse. 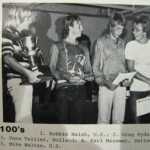 This was the last straw; the trophies could not be presented until next morning, when everyone had gone home. March sees the Australian selection trials for two boardsailors who will represent their country at the Los Angeles Olympics in July this year. One sailor will compete in triangle racing in the Windglider Class. 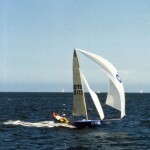 The other will take part in the demonstration event (comprising freestyle, slalom and marathon) on the Windsurfer sailboard. We look at the board that has been chosen the racing and talk with the two leading contenders. 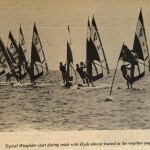 The choice of the Windglider as the Olmpic sailboard was received by most to be if not a bad decision, certainly a political one. But now that the event looms closer the Windglider is becoming generally regarded as suited to its role -if nothing else. 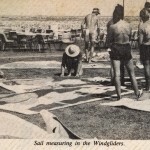 By virtue of the Windglider's larger volume and sail area it is not so sensitive to a sailor's weight. This is an advantage in the Olympics as there is only provision for one medal (no weight group racing and no medal for the demonstration event). For whatever reason, the Olympic Committee have again followed the Windglider's class rules and have not allowed competitors' to use harnesses. Looking at the board itself, it seems quite ordinary if you were not to notice the 'Chevoleat' styling of the tail area. 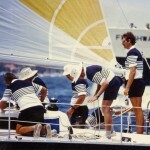 Nevertheless, for those training for the selections the only concern is their ability to adapt to the board and to sail it without a harness. When sailing the board, its lack of maneuverability stands out. The rails are so thick and straight that turning is very difficult. Understandably, gybing (especially with the centreboard down) is an acquired art. The whole situation is not helped by a very inadequate anti-skid. The standard rig has been highly criticised. The masts are quite easily broken and the Dacron sail is badly cut. The front boom fitting is unable to provide a tight fit to the mast and the boom is badly shaped (having its maximum width in the middle). But for the Olympics there is a special rig. 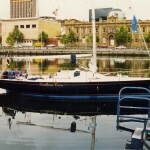 Although the standard boom remains, there is a Mylar sail and an aluminium mast. With these improvements on the sail area the same as for Open Class, the rig is very good even in the company of other Open Class sailboards. Although any board has to be sailed in its own way, this is particularly so in the case of the Windglider. All your movements have to be accentuated - the rig movements increased, the rail pushed harder, and your body more contorted. 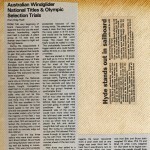 The contenders for Olympic selection have been competing in the Windglider National Championships and Olympic Selection Trials. On the basis of their performance in the trials and past performances, the Australian Olympic Selection Committee will make their decision. 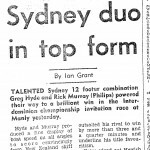 Two leading contenders are Bobby Wilmot and Greg Hyde. 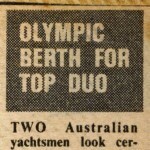 Both have been sailboarding since the sport began in Australia. 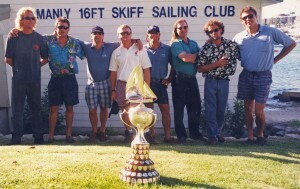 The current titles Bobby holds are: Australian National Windsurfer Class Champion (medium heavies); Wind-surfer Class World Champion (medium heavies); Dufour Wing World Champion (heavies); Overall Winner Mistral World Championships; Yacht Match Racing Series Champion (conducted on J-24s); second place overall in the Pan Am Clipper Cup (skipper Szechwan). 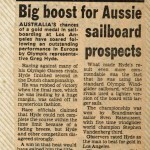 Greg Hyde is the present Windsurfer Class World Champion (mediums) as well as National Champion (lightweights and penthathlon). 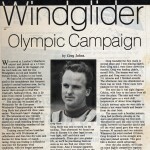 GREG, WHAT'S BEEN YOUR PRE-PARATION TOWARDS GETTING TO THE OLYMPICS, IN THE WINDGLIDERS? I haven't competed in any overseas events this year because of my study commitments. 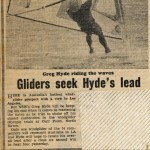 In fact the Nationals in Adelaide will be my first Windglider race. But I believe that once you have the racing experience, you don't learn much about board speed from racing. Especially for the Olympics where there is only a fleet of about 20. 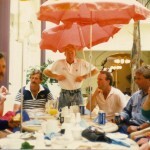 I've concentrated on going out sailing as much as I can with the best sailors that I can. 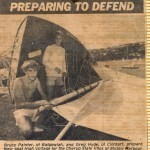 I sailed with Bruce Kendall from New Zealand for two weeks after the Windsurfer Nationals (Bruce beat Bobby in the Windglider Worlds). He was faster than me in the beginning but by the end of the two weeks I was able to sail past him. Unlike racing, in this type of situation you can stop and analyse why someone else is going faster and then be able to try something else. But when it is all said and done there isn't much difference between the way you sail different boards. You just have to make sure you are pulling the sail into the middle of the board. Maybe you have your feet in a slightly different position or a different tilt on the hull. On Wind-gliders you might have to put a little more weight on your back foot because the board doesn't want to go to windward. On an M' there's no need to put any weight on your back foot because they go into the wind so well. 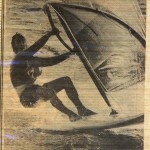 With a Windsurfer sailboard you don't put weight on your back foot because its got a flexy fin. Other than those little differences it's just setting up your equipment and not making any mistakes - or less than anybody else anyway. DO YOU HAVE ANY PROBLEMS SAILING WITHOUT A HARNESS? No, I did some gym work early on to build up my strength and stamina. Now my normal practice is 10-20 kms upwind. The Windglider course is six kilometres upwind, so I figure I haven't got any problems. But believe me after I've finished with the Windgliders I won't be sailing without a harness again. OTHER THAN THAT, WHAT WILL YOU BE DOING AFTER THE WINDGLIDERS? 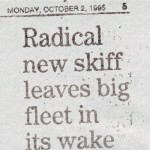 I'll certainly go back to sailing yachts again. I haven't sailed my J-24 since I won the state title last year. Next year I will have finished my business degree and I want to get on with a job. 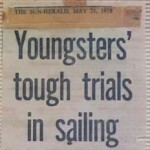 So unless I get to the Olympics and do really well, I want to give up sailboarding for a while. Just do the occasional regatta. WHY HAVE YOU ALWAYS CONCENTRATED ON TRIANGLE RACING? I also learn from my own and other people's mistakes a lot quicker. I might be on the wrong side of a wind shift on the first work but it won't happen again. So many times I see good sailors make the same mistakes over and over again. DOES NOT HAVING TO GET AN INCOME OUT OF THE SPORT AFFECT YOUR ATTITUDE TO IT? WHAT THE OLYMPICS WAS ABOUT ONCE, BUT HOW MANY PEOPLE ARE THERE LIKE THAT NOW? There are some. Bruce Kendall is certainly doing it all on his own. But in the Eastern Bloc countries it's certainly not the case from the sailboarders who I've met. They're all in the Army! Here if you want to sail all the time and compete overseas you have to be well sponsored but at the same time not be 'professional'. But unless times are really good, there isn't the money to go around to support the top sailboarders, the basketball players, however many bicycle riders etc - for the amount of training you need to do anyway. 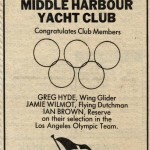 Greg achieved 6th place in the Windgliders at the Los Angeles Olympic Games. Greg won his final heat in the Windglider class showing the brilliance that won him the world championship. This gave him a scoreboard of 8-12-8-2-7-6-1 for 55.7 points. 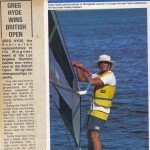 Australia's Greg Hyde makes a good start to windward of the big Windglider fleet. 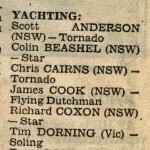 Southern Cross (Farr 40), Sydney to Hobart Yacht Race 1988. 4th over the line, 2nd overall on handicap and first in division. Southern Cross - lone boat in constitution dock after coming 4th over the line. 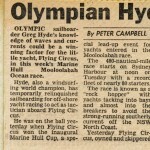 Greg Hyde's overall win in the world windsurfing championship, which ended on Lake Macquarie last weekend, was a milestone on a comeback to boardsailing that he hopes will take him into the Australian team for the 1992 Olympic Games in Barcelona. He top scored in the course racing, won the marathon, and was a useful fourth in the slalom to take the series overall by 11 points from Tony Philp (Fiji). Robbie Gough (Australia) was third. 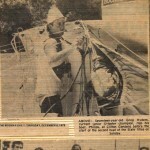 Chris Lawrence, who represented Australia at the 1988 Games and who is the world Mistral class champion, won the course-racing men's lightweight division and was third in the marathon but otherwise did not feature in the major results. 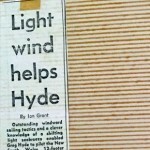 Hyde, in the medium-weight division, prepared strongly for the event with weight training in a gym and time on the water. Australia's Jessica Crisp was overall women's winner from Lanee Butler (US), with Sharon Richards (Australia) third. A total 268 competitors from 12 countries competed in the regatta, conducted from Belmont 16ft Skiff Club in a very professional way under the direction of Australian Olympic boardsailing coach Greg Johns. 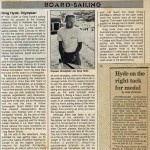 Hyde, 27, is at his best in course-racing which is the only boardsailing discipline used in the Olympics. 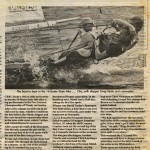 He has a strong background in dinghy and one-design keelboat racing. 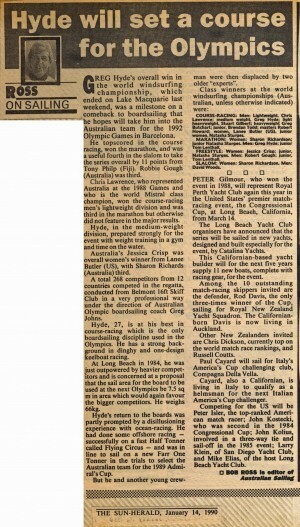 At Long Beach in 1984, he was just outpowered by heavier competitors and is concerned at a proposal that the sail area for the board to be used at the next Olympics be 7.5 sq m in area which would again favour the bigger competitors. He weighs 66kg. 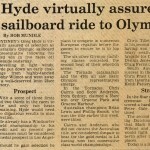 Hyde's return to the boards was partly prompted by a disillusioning experience with ocean-racing. 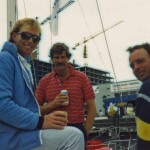 He had done some offshore racing -successfully on a fast Half Tonner called Flying Circus - and was in line to sail on a new Farr One Tonner in the trials to select the Australian team for the 1989 Admiral's Cup. MARATHON: Women: Sharon Richardson; junior Natasha Sturges. 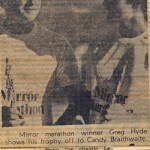 Men: Greg Hyde; junior Tom Lenthall. FREESTYLE: Women: Jessica Crisp; junior. Natasha Sturges. Men: Robert Gough; junior, Tom Lenthall. SLALOM: Women: Sharon Richardson. Men: David Woods. 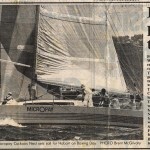 MicrOpay has won the Sydney to Hobart Yacht Race 1993 - despite conditions which forced the withdrawal of more than half the fleet. MicrOpay Cuckoos Nest - the 40 foot yacht owned by MicrOpay Managing Director, Nigel Holman, and sponsored by the company - took out first place on handicap and second place for line honours. The tiny yacht braved atrocious conditions and beat off many larger vessels to take out the honours. "We just went for it," said Nigel Holman. 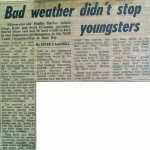 "We almost flew to Hobart under the gale-force winds and through huge seas." 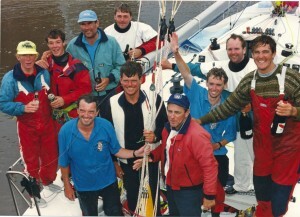 The 1993 Sydney-to-Hobart will be remembered as a race fraught with obstacles and casualties. 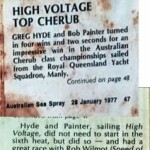 More than half the fleet of 106 boats either withdrew or were destroyed due to the consistent and near cyclonic winds and rough seas which endured from early evening on the first day of the race right to the end. 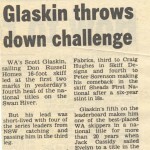 Greg moves into Skiff Racing and becomes the 1996 Australian National Champion. 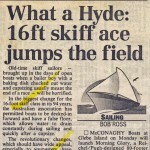 What a Hyde: 16ft Skiff ace jumps the field by Bob Ross. 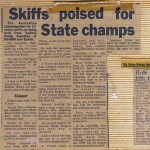 SKIFFIES on both sides of the Nullarbor agree that the 1995/96 16-footer national title series in Perth was one for the history books. 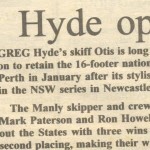 Not only did Manly skipper Greg Hyde and his skiff Otis win the title with a perfect zero pointscore, but northside solicitor Peter Sorensen -otherwise known as the Melba of Middle Harbour - posted a remarkable fourth. 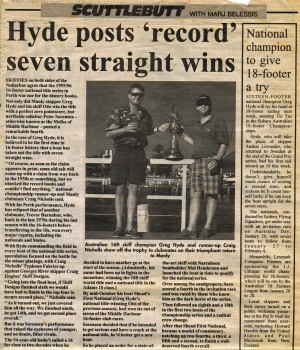 In the case of Greg Hyde, it is believed to be the first time in 16-footer history that a boat has taken out the title with seven straight wins. 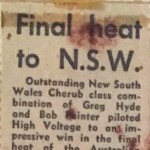 "Of course, as soon as the claim appears in print, some old salt will come up with a claim from way back in the 1930s or something, but we checked the record books and couldn't find anything," national championship runner-up and Manly clubmate Craig Nicholls said. 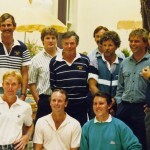 With his Perth performance, Hyde has eclipsed that of another clubmate, Trevor Barnabas, who, back in the late 1970s during his last season with the 16-footers before transferring to the 18s, won every major regatta, including the nationals and States. 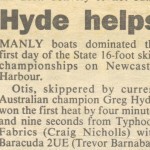 Nicholls' Typhoon Fabrics up against Georges River skipper Craig Hughes' Skiff Designs. "Going into the final heat, if Skiff Designs finished sixth we would have had to finish in the top four to secure second place," Nicholls said. "As it turned out, we just covered him all the way. We finished ninth, he got 14th, and we got second place overall." But it was Sorensen's performance that raised the eyebrows of younger, and no doubt, fitter rivals. 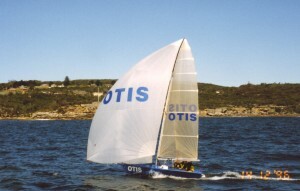 By mid-October his boat Shead's First National (Greg Hyde's national title-winning Otis of the previous season), had won six out of seven of the Middle Harbour 16-footer club races. 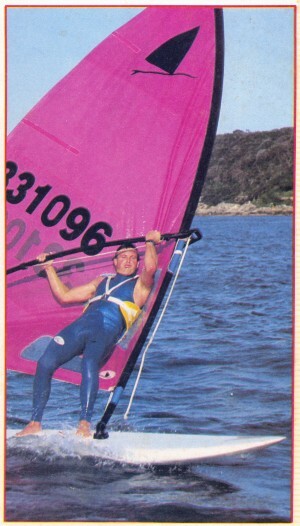 Sorensen decided that if he intended to get serious and have a crack at the national title, he'd better get a new boat. 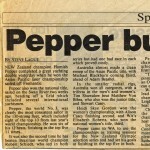 So he placed an order for a state-of-the-art skiff with Narrabeen boatbuilder Mal Henderson and launched the boat in time to qualify for the national series. 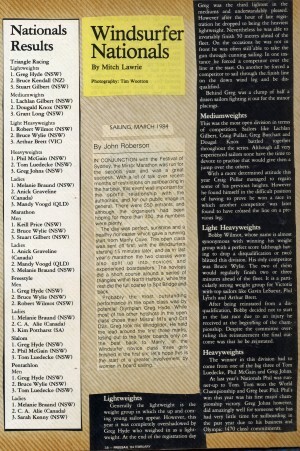 Over among the sandgropers, Soro scored a fourth in the invitation race and was rated by those who knew him as the dark horse of the series. Then followed an eighth and a 10th in the first two heats of the championship series and a radical crew change. After that Shead First National, became a model of consistency, notching up two fourths, a third, a fifth and a second, to finish a well-deserved fourth overall. 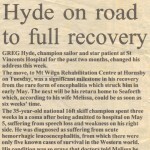 GREG Hyde, champion sailor and star patient at St Vincent's Hospital for the past two months, changed his address this week. The move, to Mt Wilga Rehabilitation Centre at Hornsby on Tuesday, was a significant milestone in his recovery from the rare form of encephalitis which struck him in early May. 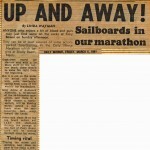 The next will be his return home to Seaforth which, ' according to his wife Melissa, could be as soon as six weeks' time. The 35-year-old national 16ft skiff champion spent three weeks in a coma after being admitted to hospital on May 5, suffering from speech loss and weakness on his right side. He was diagnosed as suffering from acute haemorrhagic leucoencephalitis, from which there were only five know cases of survival in western world. His condition was so grave that doctors told Melissa he could die within 48 hours. However, Greg came out of the coma after three weeks and began the process of recovery. "His speech is gradually improving, but he still finds it hard to get words out," Melissa said. "He is having to re-learn so much almost from scram; but his spirits are very high." includes light snacks, beer and wine. 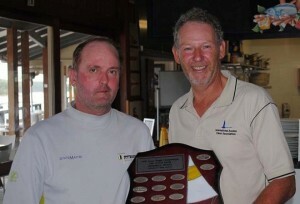 MIDDLE HARBOUR sailor Greg Hyde was disappointed with his sixth placing in the 16ft skiff nationals. 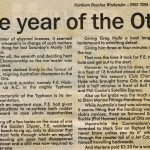 "It's the same as last year," said the skipper, who for two years running (1994/95 and 1995/96) blitzed his opposition, scoring an unprecedented victory in the '95/96 national championship by winning seven races on the trot. Then came the near-fatal illness, a rare form of encephalitis, which struck Greg down in mid-1996, which left him in a coma for several weeks and from which he slowly recovered after months of rehabilitation. Greg had to learn to walk, talk and read again from scratch. 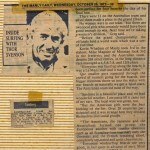 Few of his peers thought he'd sail again, but the champ confounded them and by November he was back at the club he'd sailed with for several seasons, Manly 16-Footers, boasting he'd be back on the water by Christmas. He was as good as his word and in the national series shortly afterwards scored an amazing sixth place. 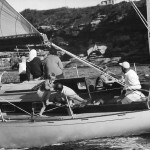 The start of the current season saw him leave Manly and rejoin the Middle Harbour 16ft Skiff Club fleet, with whom he'd sailed for several years before joining Manly. First he sailed his old boat and then, just two months ago and three weeks before the State series, he took delivery of a new boat. 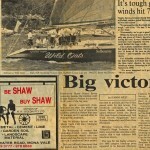 Although he had no sponsor, all the old sailing skills were still intact and so was the will to win, and before long Greg and his crewmates Andrew Divola and Steve Polkinghorne had established themselves at Middle Harbour as the crew to beat. Their 10th in the State series could be put down to getting used to the new boat. 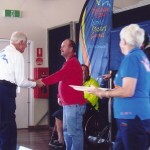 For the recent national series, Greg acquired a sponsor, Windsurfer, and although his sixth placing was the same as last year, he was the best placed Middle Harbour skipper. Greg is already looking ahead to the 1998/99 season when he and his crewmates will cross the Nullarbor to contest the nationals in Perth. With a bit of help from the Fremantle doctor, there's a good chance they'll return to the winners' circle. Greg wins a gold medal at the 2009 Masters Worlds Games in the Access 303 (for 45+ years). Imagine how you'd feel if your very successful and comfortable life was suddenly devastated by a debilitating illness leaving you largely dependent on others for your everyday needs? 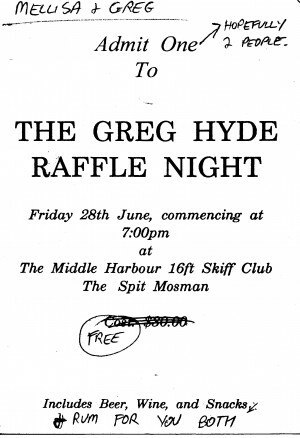 That's exactly what happened to well known local sailing identity, Clontarf resident Greg Hyde. 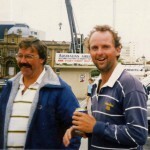 Greg has been the Windsurfing World Champion, earned a plaque in Manly West Esplanade's walk of Olympians representing his country in Los Angeles in 1984, was the National 16ft skiff champion, and joint helm of Manly Yacht Club's winning entry "Cuckoo's Nest" in the storm ravaged 1993 Sydney to Hobart yacht race. 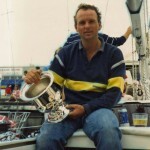 Thirteen years ago, Greg was cut down at the height of his sailing prowess by a rare and usually fatal form of encephalitis, subsequently he suffered epilepsy, and in 2008 had a stroke which resulted in partial right-sided paralysis, short-term memory loss, and speech difficulties. Greg has shown tremendous courage overcoming his frustration and coming to terms with his current situation, and rather than adopt a" victim" mentality, has chosen to concentrate on becoming the best he can possibly be with what he's got, and in the process be an inspirational role model for others with disabilities. Recently introduced to Sailability, a volunteer organisation that gives people of all ages and abilities the opportunity to experience "Freedom on the water," Greg has shown that mercifully he's lost none of his natural ability in the water sport he loves. Through Sailablity Greg has been introduced to sailing the single seat 2.4m class of dinghy, an exhilarating and challenging experience for most able-bodied sailors! 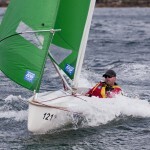 Thrilled to be back at the helm of a lively craft, in April Greg attended a Paralympics training camp in Perth with 8 others trying for the place in the 2.4m dinghy class with the goal of representing Australia at sailing in the 2012 Paralympics games in London. Finding a sponsor for sails is now a top priority. 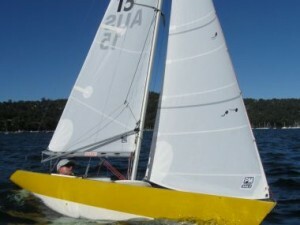 The new boat arrives in July, and will be kept with the Sailability NSW fleet of 2.4m on the hard stand at Crystal Bay, courtesy of the RPAYC. A great deal of thought has gone into the configuration of the new boat with help from former windsurfer sparring partner and respected sailing coach Lachlan Gilbert. "Although Greg's lost none of his natural ability, he's tremendously frustrated by his fluctuating physical and mental abilities and needs to work on his concentration and building stamina" explained Lachlan. 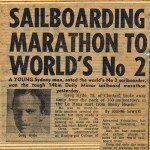 "The new boat will be innovatively set up to take best advantage of what he CAN do,"
Physios and nutritionists have also been a great help with programs to build his technique, strength and fitness, both mental and physical for this challenging journey. If Greg is to be successful, he will have to train on the water regularly, and this will need the committed help of a dedicated team of volunteers with some sailing or boat-handling experience. Sailability NSW President Allan Jones assisted by Pittwater and Manly volunteers including on water sparring partner, Peter Whalan, are training those donating their time, in rigging, launching, sailing the 2.4m and operating the chase boat. Many are retirees who find that being involved is not only teaching them new skills, but giving them a renewed sense of purpose and pride. However, if Greg is to fulfill his Paralympics dream more recruits are needed in "Greg's navy"! Newport resident Barbara Kendall is Greg's rock, and co-ordinates his sailing program. "I'm so proud of my brother and we're both touched and appreciative of the wonderful team of volunteers gathering around us" said Barbara Kendall. 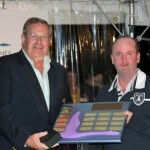 Macquarie Group Access World Championships 2012, hosted by Middle Harbour Yacht Club, kicks off on Monday 9th April. 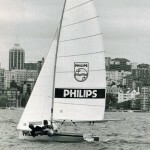 95 boats and 126 sailors will take over a part of Sydney Harbour, and Telstra will be there to support the event. Telstra is delighted to be involved in supporting such an event and is fulfilling the event's communication needs by supplying mobile phones and Wi-Fi communication hubs across its Next GÂ® mobile network to support the event's complex logistics needs both on and off the water. Telstra's Area General Manager for Sydney, Andrew Bogg, said 'Telstra has a long and proud history of supporting athletes of all abilities, including with disability. This is demonstrated by our long-term support of the Australian Paralympics Committee and by way of equipment grants in support of athletes with disability across a range of sports. 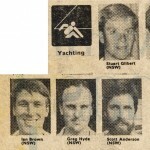 One such sailor to benefit from Telstra's participation is Greg Hyde. 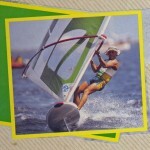 The Clontarf resident is a former windsurfing world champion who represented Australia at the 1984 Olympics. 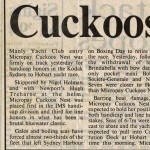 He was also a 16ft skiff champion and crew of the 1993 Sydney Hobart overall winner, Cuckoos Nest, before a usually fatal form of encephalitis struck him 14 years ago. 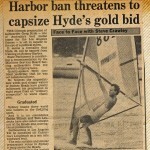 Not to be deterred, when he was able, Hyde took up sailing again, and went on to win a gold medal at the 2009 Masters Worlds Games in the Access 303 (for 45+ years), and is highly rated to take the same class out at the Macquarie Access Worlds. 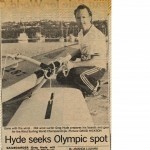 'I am absolutely looking forward to the Worlds,' Hyde said as he headed off to get some training on Sydney Harbour this morning. 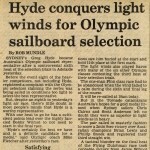 Hyde, a well-known local sailing identity, who will sail in the Access Liberty single-person class, says those Aussies who know the Harbour will have the edge. 'Absolutely we'll have the upper hand, knowing the wind and tactics. The Harbour can be shifty at this time of the year; catch one good shift or a wave and you can leave the rest of the fleet behind,' he said. 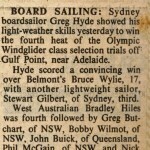 Competing at his first Access Liberty regatta, Hyde beat experienced Liberty sailors Coates (Qld) and David Staley (Vic), scoring six straight wins leaving his compatriots to fight it out for the minor placings. Both are looking forward to Hyde's ongoing involvement in the class. 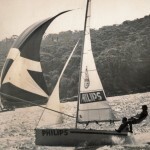 'Although Greg is very familiar with the conditions on Middle Harbour, he just sailed faster and better than the rest of us,' Coates confessed. 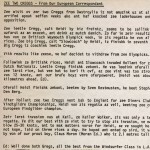 'Having someone of Greg's calibre sailing in the Liberty fleet at the Worlds will help lift the standard of competition to a new level,' he added. Adding to its support, Telstra has also put out a call out for volunteers from among their staff. What many people won't realise are the logistics of an event of this nature and magnitude and the help required to help run it. At least 40 wheelchairs will have to be dealt with, including getting athletes in and out of them and storing while racing takes place. Help is also required getting some sailors in and out of transport, into boats each day, and back to dry land and the Club afterwards. 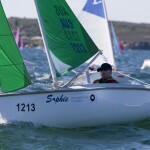 The 2012 Macquarie Access World Championships are a rare opportunity for disabled sailors to pit their skills against their able bodied counterparts at an international level. Don't be surprised to find a few able-bodied sailors left behind on the race track; there are many extremely talented disabled sailors in the fleet.